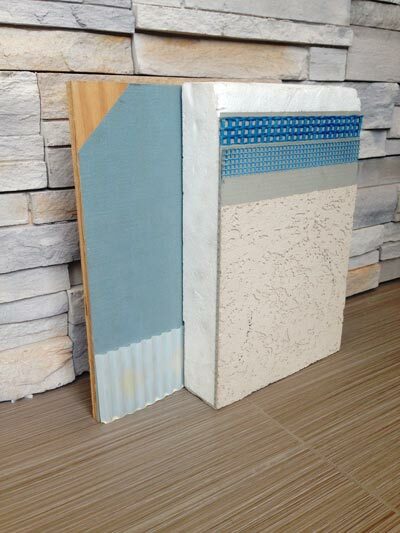 Exterior Insulation and Finish Systems (EIFS), a product well-known in the commercial sector and primed to catch on the residential, offer architectural refinement and flexibility while delivering superior energy efficiency for your home. The systems consist primarily of polystyrene foam board with a textured acrylic finish that resembles plaster or stucco. The big plus of the exterior wall system is that it encapsulates the building in a thermal blanket. Conventional cladding does no such thing. To increase energy efficiency, most builders simply add more insulation to cavity walls. But that approach has a side effect called thermal bridging. It is a condition that occurs when studs (which typically have only an R-1 value per inch) bridge the insulation, allowing heat to pass through them to the outside. If, for example, insulation batts rated at R-20 are placed in a wood frame wall cavity, on the coldest days the insulating performance of those batts will drop substantially as low as R-10) if the home is clad in brick or vinyl. Replace that brick or vinyl with an EIFS system and the R-20 doesn’t lose its value. In fact, with EIFS-typically rated at R-8 to R-10 – a home’s clear insulation rating will be in the order of R-30 and perform at a whole wall value much greater than the R-20. By increasing your wall cavity thickness from 2×4 studs to 2×6 studs you are buying R-8 of extra insulation to fill the added space and getting R-6 of performance in return. When you buy R-8 of insulation you get R-11 in performance because it eliminates thermal bridging, thereby making the batt insulation perform closer to its clear value. It is worth noting that the wood frames of today’s homes represent at least 25 per cent of the exterior walls. Other exterior cladding options offered by ZZ Construction include various types of siding (cedar, mahogany, and James Hardie), Cultured Stone, and the AL13 Architectural Panel System. Stop by the showroom or send an e-mail to request a free, no obligation, in-home estimate. ZZ Construction Ltd. is the leading supplier of exterior cladding systems across Calgary, Airdrie, Okotoks, High River and Chestermere areas. Our attention to detail and excellent customer care makes us leaders in the field. Don’t take chances with a amateurs or one-man bands. At ZZ Construction Ltd. we employ only highly qualified plastering applicators with many years of trade experience. We are a BBB Business since 2009 with an A+ rating. Cladding is hard wearing, durable and requires minimal maintenance only. It serves as a protection for the residential home or commercial building. Howling winds, torrential rain, and intense heat from the sun can all be extremely detrimental to the home’s exterior when exposed all year round to the elements across Calgary, Airdrie, Okotoks, High River and Chestemere. Exterior claddings provide a clean, and seamless appearance providing an attractive aesthetic and has unlimited color selection, and textural style. Once installed, no further work is required and walls, joists, and roof rafters are all protected against the elements and other corrosive properties that can affect them. Other exterior cladding options offered by ZZ Construction Ltd. include various types of siding (cedar, mahogany, and James Hardie), Cultured Stone, and the AL13 Architectural Panel System. Stop by the showroom or send an e-mail to request a free, no obligation, in-home estimate. Proudly serving Calgary, Airdrie, Okotoks, High River and Chestermere areas. If you’re interested in finding out more about claddings and how it can benefit your home, come over at ZZ Construction Ltd and we can walk you through the many options we have available.